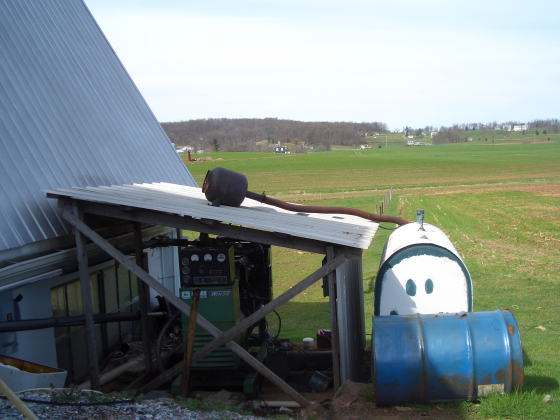 An “Amish electricity” generator in Lancaster County. And yes, it is smiling at you. They were mounted on trailers and pulled to a site to be used for radio transmittors. If so, that is sort of ironic isn’t it? An Amish person using Army surplus equipment! Well, not really ironic in one sense. The Bible prophesies that “they shall beat their swords into plowshares”! You cant beat taking something used for evil and turning into something productive. Another irony is that the Amish celebrate , every October 11 th ,the feast of Saint Michael (no work, etc, etc,.) the reason being, as we understand it, is that he is considered “Der Deutsche Michael” , the patron of the Germans. St. Michael is also associated with the Army of the Lord – – he is depicted wearing warrior armour, wielding a sword and doing battle with the devil. Military, law enforcement and fire-fighters consider him as their patron as well. While I didn’t inspect this one super-close, this would be a diesel engine which likely drives an air compressor for pneumatic power. Noisy and nasty, but gets the “juice” to where it needs to be while staying off the grid. This is outside a small-scale craftsman-type operation. I have noticed Amish friends use military metaphors to make points though, more often than you might suppose.